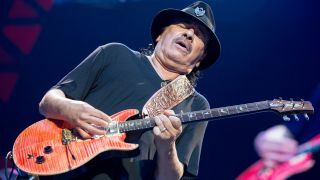 From starring at Woodstock to winning multiple Grammys, Carlos Santana has seen it all. But how will he cope with the 10 questions we ask everyone? "I got it in 1960 in Tijuana, and my father bought it for me. It was a big, hollow Gibson, kind of like Wes Montgomery's. I liked that it had six strings and I could bend them and learn how to play chords and connect with BB King. "I was a violin player before that. The first thing I noticed with the guitar was that you couldn't make long notes like you could by going up and down with the bow. But later on, I discovered you could do that with feedback instead..."
"You can't play a Strat like you are petting a poodle. You've got to stand like Rambo!" The building's burning down - what guitar from your collection would you save? "My '54 Stratocaster. That was the first year they made those guitars. It's the tone; it has a different resonance." "The Stratocaster. I played Stratocasters on some songs on the last two albums. The approach is different with Stratocasters, you have to have a lot more intensity and tenacity or you start to sound a little hokey! "Jimi Hendrix, Eric Clapton, Stevie Ray or Jeff Beck - when they play, they stand like they have a flamethrower! You can't play a Strat like you are petting a poodle. You've got to stand like Rambo!" Is there a guitar you regret letting go? "I don't really regret giving it away. He just passed - he was one of the premier guitar players but he never got his credit like Albert or Freddie or BB - and his name was Bobby Parker. "I gave him this incredible cherry '57 Stratocaster. I think later he sold it because he needed the money, but that's okay. I feel good because I gave it to him and I love him. But I loved that guitar." What's the next piece of gear you'd like to acquire? "I have everything that I need. I have Dumble amplifiers, I have a relationship with Mr Alexander Dumble. I stopped looking because I have found everything." If you could change one thing about a recording you've been on, what would it be - and why? "That was where I was at the time. I have no regrets about any playing that I've done." "We always meditate, we blank our brains. We ask for the presence of the Holy Ghost. The biggest illusion on this planet is for people to be indoctrinated with the concept of the wretched sinner, unworthy of God's grace. We meditate so that our music will elevate people into not thinking like that." "I decompress by going home and jumping in a nice pool. I like being inside a pool... I close my eyes and I'm not dealing with Carlos or Santana for a while." What's the worst thing that's ever happened to you on stage? "Fortunately, I don't have any dark stories! Every time I go on stage it's like Niagara Falls of good energy and good blessings, and by the grace of God, like Buddy Guy, I can wield my guitar to manifest what I want it to do." What would you play on acoustic around a campfire? "I would choose to play something very intoxicatingly Spanish... but reggae style!"